There's no question about it: your children are the most important thing in your life. But if you have gone through a messy divorce, your relationship with your children may become strained if you have to deal with a toxic ex. Your ex may bad-mouth you in front of the kids, accuse you of being a bad parent, and even attempt to replace you in the children's lives with a new partner. As a result, your children may become confused, conflicted, angry, anxious, or depressed--and you may feel powerless. 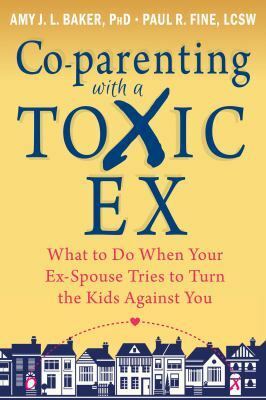 In "Co-parenting with a Toxic Ex," a nationally recognized parenting expert offers you a positive parenting approach to dealing with a hostile ex-spouse. You'll learn to avoid the most common mistakes of coparenting, how to avoid "parental alienation syndrome," and effective techniques for talking to your children in a way that fosters open and honest response. In addition, you'll learn how to protect your children from painful loyalty conflicts between you and your ex-spouse. Divorce is often painful, especially if your ex habitually tries to undermine your relationship with your children. But with the right tools you can protect your kids and make your relationship with them stronger than ever. This book can show you how. You can find out more about this book and about author Amy J.L. Baker at www.amyjlbaker.com.